It wasn’t the filet mignon I’d had my heart set on. But that evening turned out to be one incredible night, greasy sliders and all. As a fresh-faced college grad, one of my first jobs was in arts marketing at an Indiana university. SInce I was the newbie, I was often given the job of picking up various artists, speakers, and musicians who would fly in from around the country to perform on campus. Besides for the fact that I was highly directionally-challenged in the pre-GPS era and often ended up driving famous people in circles, I was perfect for the gig. I loved meeting new people and was a creative at heart (writing and music are my jam). I got to meet and hang out with some fascinating people—from coach Mike Krzyzewski to poet Amiri Baraka, classical music greats like the Eroica Trio to singer Rufus Wainwright. I was starstruck and geeked out at the opportunity to interact with legends from all different genres and backgrounds. But I learned quickly that not all successful people are nice people. That might sound naive, but my starry-eyed, early 20s self really expected these artists to at least be polite, gracious, and respectful most of the time. Some of them were. But many were not. I started to get disillusioned about the whole thing and dread the next big event. Until the night I ate White Castle with Benny Golson. If you’re not familiar with sax player and jazz legend Benny Golson, let me give you the skinny. This incredibly talented man was born in Philly in 1929, was buddies with the beloved John Coltrane, and played alongside jazz gems like Dizzy Gillespie, Benny Goodman, and Art Blakey. Not to mention he’s an innovative composer and performer whose standards are still being played today. 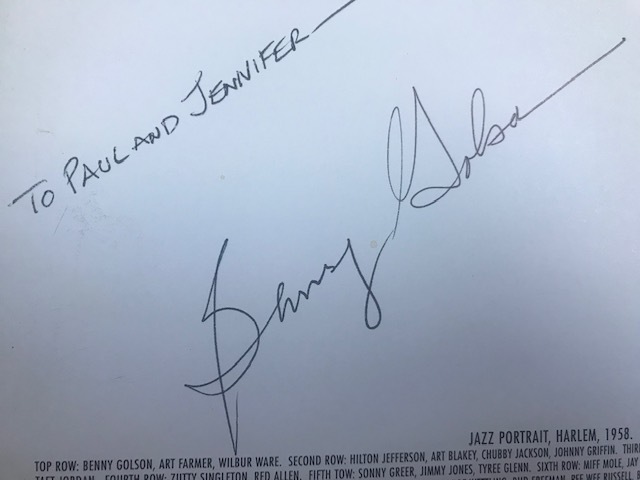 And as a kid who grew up playing alto sax and loving jazz, I was speechless when I heard I was going to pick Benny Golson up at the Indianapolis airport. But, full disclosure here: I was also giddy about the gig because part of the fun of chauffeuring artists was taking them out for nice dinners on the university’s tab. (Keep in mind that I was a broke 20-something, Totino’s Party Pizza-eating, single young adult at the time.) So a steak and roasted vegetables at a fancy downtown restaurant—for free? Sign me up. I picked Benny up at the airport curb, fully expecting a gruff, distant, slightly arrogant man, much like the handful of famous performers I’d worked with recently. I couldn’t have been more wrong. Benny was soft spoken, kind, and had gentle eyes that twinkled when he laughed. I immediately loved the guy and we started nerding out talking saxophones as we headed downtown for dinner. I offered up some of the best restaurants in the city, secretly hoping he’d choose the fanciest steak house. He left the decision to me, so I headed that way. You’ve got to be kidding me. Here sat a legendary musician in my passenger seat who could eat anywhere he wanted, buy anything he desired, and he was jonesing for some greasy, onion-covered sliders. Yep. I turned the car around and the next thing I knew, I was eating White Castle with a jazz superstar. I peppered the poor guy with tons of questions, asking about his latest compositions and performances, his friendship with Coltrane, and what it was like being on set with Tom Hanks in The Terminal. He graciously answered all my nosy questions in between onion rings and tiny burgers, and asked about my life, too. 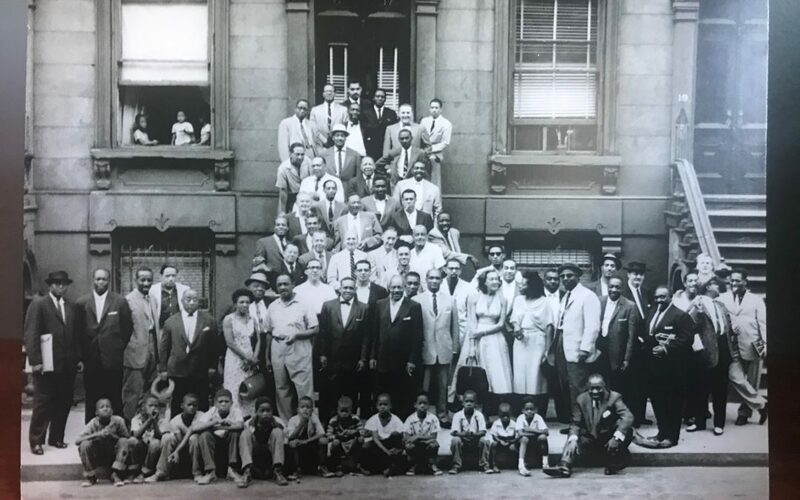 He said my fiancé, Paul, “better treat me right.” He signed my Harlem 1958 print, a famous photograph of 57 jazz musicians in New York City, including Count Basie, Thelonius Monk, and Benny, of course (the same photo Tom Hanks’s character cherishes in The Terminal). After dinner, I drove him to his hotel. With a hug and profuse thanks for my hospitality, Benny said goodnight and carried his bags inside. I stood there dumbfounded, taking in the evening’s events. 1. It’s better to be kind than rich, successful, or famous. 2. I’d take sliders with a fascinating human like Benny Golson over five-star dining any day. What about you? How has kindness (or lack thereof) influenced you?